Thanks for the well wishes - I'm feeling pretty human! We're off to Boston early tomorrow morning - looking forward to seeing some dear friends. I have buttons to sew on my Tempest now from Mood Fabrics (yes, that Mood, for Project Runway fans), which I'll do on our way up there. I find car rides conducive to finishing work for some reason. Maybe it's being trapped in the car. I'm sure I'll have much to share on my return - in addition to the Sheep Shearing at Gore Place on Saturday, I hope to visit Emma's Pizza (yum! ), Windsor Button, Yarns in the Farms, and Woolcott and Co. Have a great weekend! What's a post without a picture? Isobels' shrug in action, along with her mittens for this winter. Man, am I sick and tired of being sick (and tired). I have a Sassymetrical to show you, all finished for my sister knit from Romney Ridge Farm's merino/mohair blend. And I just need buttons for my beautiful, blue Tempest, but that would involve hauling myself somewhere other than Isobel's school, and I'm just not quite up to that. Luckily, Penelope only woke up once last night. I'll be back when my lungs and sinuses clear up with pictures of lovely FOs. Maybe there will be a few more by then! P.S. We're coming up to Boston next weekend (someone is giving a talk at Harvard on Friday) and are probably going to the Shearing Festival at Gore Place on Saturday. Want to join us? Isn't it pretty? It's like a cloud. In fact I'm considering sewing a little comb into it to keep it in place when it's windy. I've been wearing it on the crown of my head, like all the hip, young girls here in NYC, rather than down on my forehead like a beret. Or I might weave some elastic into the headband. With smaller needles CO 3 stitches. Work i-cord for 1". Round 1: Kfb 3x as for i-cord (6 st.). Rd 2: Knitting onto three larger DPNs, [kfb, k1] 3x (9 st.). Join to work in the round. Rd 3: Knit all stitches. Rd 4: [K1, yo] 9x (18 st.). Rds 5-7: Knit all stitches. Rd 8: [K1, yo] 18x (36 st.). 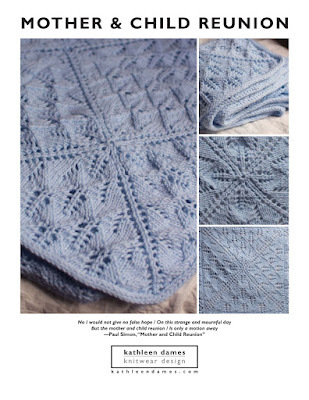 Rds 13-14: Knit all stitches. Rds 16-28: Work Miniature Leaf pattern 3x. Rd 29: Knit all stitches. Rds 31-38: Work Miniature Leaf pattern 2x. Rd 39: Knit all stitches. Rds 41-end: K1P1 around until ribbing measures 1". Bind off in rib. Weave in ends. Block firmly to open up lacework. In the round, knit rows 1 and 3.